Haines sounds endearingly surprised that anyone might be interested in her away from the cinema screen, where she made such a startling arrival this year in Steve Jacobs’s “Disgrace” – which opens in the UK today, on the heels of an all-too-brief Stateside run in the fall. This speaks both to the 30 year-old newcomer’s natural humility – if she is aware of just how good she is, she certainly hides it well – and her relative unfamiliarity with the ropes of the industry. As if to literalize the point of just how far removed Haines is from Hollywood, I learn that she is in Tunisia not, as I had assumed, on some remote location shoot, but for a decidedly simpler reason: it’s where she lives, thanks to her husband’s banking career. Haines’s personal sense of statelessness adds a fascinating interpretive layer to her performance in “Disgrace,” a superb adaptation of J.M. Coetzee’s modern literary classic, and the most undervalued work to emerge from the recent mini-wave of South African stories on film. In the year’s most impressive debut, Haines plays Lucy, the headstrong lesbian daughter of John Malkovich’s dissolute academic protagonist. 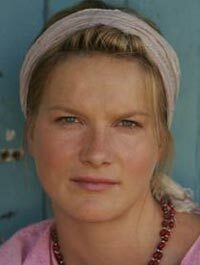 A woman so determined to cling to her own notions of home – specifically, a ragged, isolated Eastern Cape smallholding – Lucy winds up making unthinkable personal sacrifices to do so, in the face of physical and psychological terrorization by black neighbors seeking post-apartheid retribution. It’s that devotion to the land that allowed Haines access to a character she found inscrutable in Coetzee’s novel. Haines is sweetly effusive in person, such a far cry from her stoic, guarded character that she didn’t much fancy her chances of landing the role – not least when the likes of Cate Blanchett had expressed interest, and Haines, who had done some local TV work but cites ballet and physical theater as her first loves, had never done a film before. Ironically, Haines’s nationality made her something of an anomaly on the set of the Australian production – in addition to the American Malkovich, principal co-stars Eriq Ebouaney and Fiona Press are French and Australian respectively. Haines is unfazed by criticism of the film from South African industry voices – “I’m tired of this argument of ‘taking stories’ … the stories are there to be taken” – and takes pride in the film’s global identity. That’s Haines’s winning South African modesty resurfacing, though she’s getting more used to star encounters: she recently finished work alongside Ian McKellen on “The Prisoner,” an update of the cult 1960s TV series, as well as with Ryan Philippe and Taylor Kitsch on “The Bang Bang Club,” a biopic of the late South African photojournalist Kevin Carter. Right now, as she prepares for a move to Kenya and hopes the right people see her work in “Disgrace,” Haines admits to feeling “a little directionless … I’m not sure what my next move should be.” Here’s hoping it’s upwards. Terrific film which is definitely underrated. I really don’t understand how this didn’t get treated better in the US. It won a prize at Toronto, and didn’t get a tiny release until about a year later.